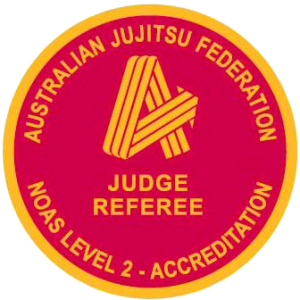 The Australian Jujitsu Federation Inc. (AJF) as the National Sporting Organisation (NSO) recognised by the Australian Government through the Australian Sports Commission has responsibility for the development and administration of the National Officiating Accreditation Program for all Jujitsu and related martial arts involved in competition including: Sport Jujitsu and Brazilian Jiu-Jitsu, throughout Australia. An accredited official has provided evidence to satisfy the membership criteria of the Federation. In addition he or she has successfully completed an approved accreditation course specific to our members. This course will have included: risk management, appropriate legislation, health and safety, and more. Under the Federation’s accreditation program there are 4 Levels of accreditation. However, the first 2 levels are most common: Level 1 Administration, and Level 2 Judge/Referee. The Australian Jujitsu Federation is the only recognised authority to provide and administer accreditation within the competitive martial arts of: Sport Jujitsu, Brazilian Jiu Jitsu and Grappling. 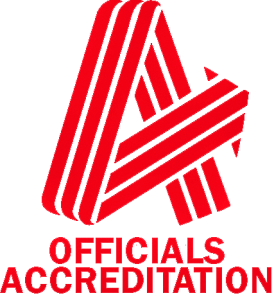 Each accredited official is issued a personal ID Card that includes details of their accreditation level and expiry date of their accreditation. For more information please contact the Federation.